Like last week’s “Now and Then” comparison, this one looks toward the front entrance of the Moore Theatre. 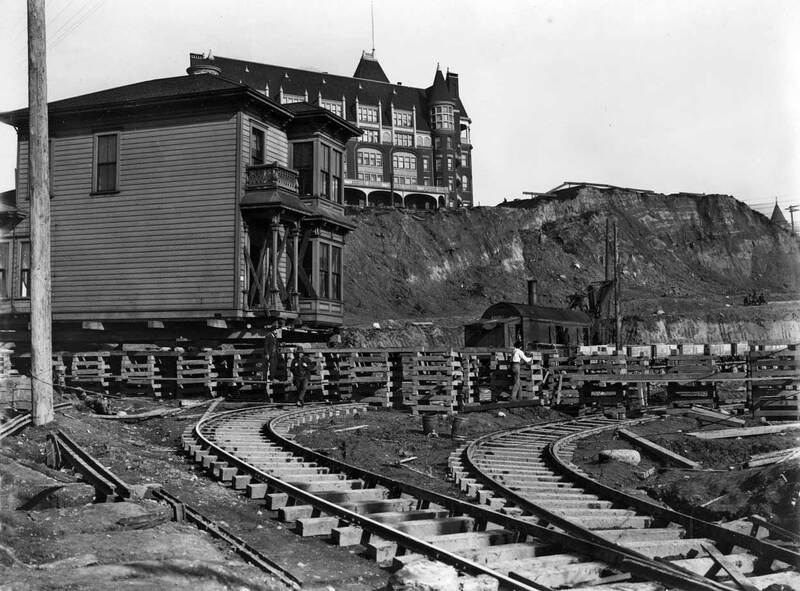 This unique photograph was shot in late 1905 or early 1906, and provides a view of the intersection of Virginia Street and Second Avenue during the razing of Denny Hill for the Denny Regrade. Jean Sherrard’s “now” view helps us visualize where the Moore marquee would later stand after the regrading on Second Avenue was completed and the theater quickly constructed. It would materialize to the far side of the steam-powered excavator with the black roof, which stands right-of-center beyond the house-moving trestle. This crude but workable timber skid temporarily crosses the curving tracks used for the regrading work of removing the hill, most of it into Elliott Bay. Only a handful of the scores of homes that covered Denny Hill were saved. This Italianate box being inched along the skids was one of the survivors. The grand Victorian landmark looming behind it was not. The Washington Hotel was one of the greater architectural losses in our still brief history. Built in 1890 straddling Third Avenue on the front (south) hump of the hill, the hotel did not open until 1903 when James Moore — of the theater — purchased it from its squabbling owners and welcomed Theodore Roosevelt that spring as its first guest. Moore’s plans were to enlarge the hotel and put a roof garden on the theater to blend with the landscaping for the hotel. About the time this photo was recorded he changed his mind and allowed the hotel to be destroyed with the hill. THEN: An early-20th-century scene during the Second Avenue Regrade looks east into its intersection with Virginia Avenue. A home is being moved from harm's way, but the hotel on the hill behind it would not survive the regrade's spoiling. Courtesy of Ron Edge. 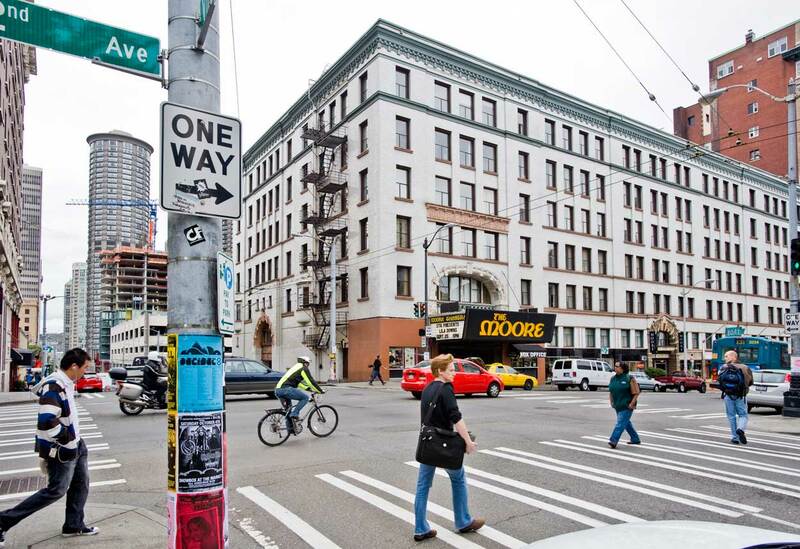 NOW: The Moore Theatre at the southeast corner of Virginia Street and Second Avenue, and, behind it to the right, the New Washington Hotel, now sit where Denny Hill and the old hotel once stood. Any idea whose home that was / where it ended up?